Sailing time to Block Island	from Galilee is 1-1/4 hours for the traditional ferry, only 30 minutes for the fast ferry; from Newport RI CT the ferry takes 2 hours. New England Airlines, Block Island's own airline, will fly you over from Westerly State Airport, Westerly RI 02891 on daily flights year round. You must make advance reservations. The airport is on Airport Road, Westerly, off RI Route 78 (map), just over 3 miles (4.8 km) southeast of the Westerly Amtrak train station. Galilee is the port with the most frequent ferry service, and there are six to nine daily sailings by The Block Island Ferry in each direction from mid-June to early September. The trip takes less than 1-1/4 hours. Passengers and bikes need no reservations, but to ship a car you must have reservations in advance. Motorcycles and bicycles are also carried. The Galilee agent is the Interstate Navigation Company, Galilee State Pier, Point Judith RI 02882 (tel 866-783-7340 or 401-783-4613). Get to the Galilee dock at least 45 minutes before sailing time. During spring, fall, and winter the car ferry makes fewer trips: two daily in each direction in May and early June, and late September through October; in winter, there's one trip daily. There is also high-speed ferry service by the same company from Galilee. The high-speed catamaran ferry carries passengers and bikes only (no cars), and makes the voyage in about 30 minutes, though tickets are more expensive than on the traditional car ferry. No reservations required. Get to the Galilee dock at least 45 minutes before sailing time. The Block Island Ferry (alias the Interstate Navigation Company), operates daily summer high-speed ferry service from Perotti Park(map), 39 America's Cup Avenue in the center of Newport, to Block Island. The ferry carries passengers only, no vehicles of any kind (including bicycles) on the one-hour voyage. 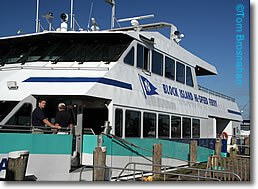 Block Island Express operates ferry service in summer between the New London Ferry Dock at 2 Ferry Street, New London, CT 06320 (map), not far from New London's Union Station for Amtrak trains. You can also take the Cross Sound Ferry from Orient Point, Long Island NY, to New London, then transfer to the Block Island Express ferry to reach Block Island. On Block Island, the ferry uses the Old Harbor. Because Block Island is so small—7 miles (11 km) from one end to the other—walking and biking are favorite ways to get around. Motorbikes are for rent from various shops on the island, and hotels shuttles and taxis are available to help you get your luggage to and from hotels. waits for passengers at Galilee RI. 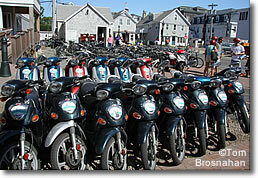 Motorbikes for rent on Block Island.